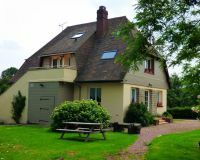 Enjoyable house with outdoor games, near Honfleur. 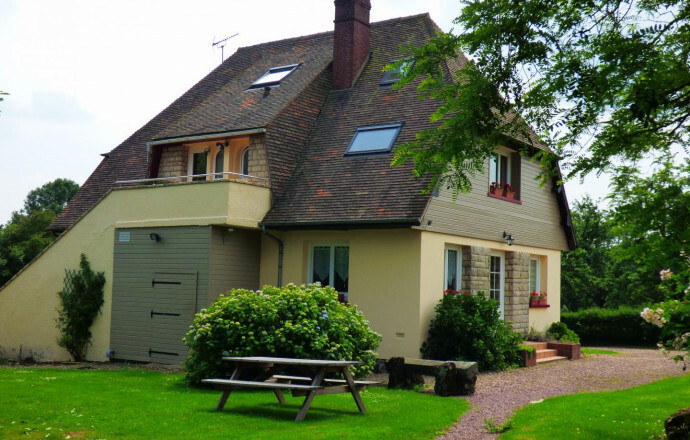 Located on the ground floor of a large contemporary house, the lodging offers a very modern comfort. Spacious and functional, it has also many places of relaxation in a beautiful garden offering views over the Normandy countryside. Well equipped for a pleasant stay at the gates of the Pays d'Auge, near the Côte fleurie. Adjacent to another gite upstairs (ref. 1045 for 10 pers.). GROUND FLOOR : entrance, living room with sofa bed, kitchen, 2 bedrooms (1 double bed 160x200 cm, 1 double bed 140x190 cm, 1 single bed), bathroom with shower and bathtub, toilet. A 500 m² private garden, not overlooked. Shared by the 2 cottages : swing, trampoline, table tennis. Bed and breakfast also on-site.